Philip J. (P.J.) Crowley is a Professor of Practice and Fellow at the Institute for Public Diplomacy and Global Communication at The George Washington University. P.J. appears frequently as a national security commentator on national and global television networks, including as a regular contributor to the BBC. He writes regular opinion columns for the BBC and MSNBC. Recent opinion pieces have also been published in The Washington Post and The Guardian. Atlantic Magazine named him as one of 21 Brave Thinkers in 2011. P.J. held the 2011-2012 Omar Bradley Chair of Strategic Leadership at the Penn State Dickinson School of Law and School of International Affairs, Dickinson College and the Army War College. In November 2012, he authored The Rise of Transparency and Decline of Secrecy in the Age of Global and Social Media for the Penn State Journal of Law & International Affairs. P.J. was nominated by President Obama as the Assistant Secretary of State for Public Affairs in 2009 and confirmed by the United States Senate. 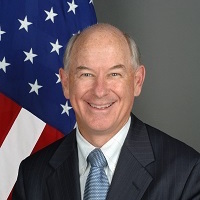 He served as the Assistant Secretary and Spokesman at the Department of State until March 2011. He was the primary U.S. government interlocutor with major media regarding the impact of the release of classified diplomatic cables by WikiLeaks. Before joining the Obama administration, he was a Senior Fellow at the Center for American Progress, with a particular focus on homeland security in the aftermath of 9/11. He authored several national security studies, including Safe at Home, a detailed homeland security strategy to protect the American homeland, improve national preparedness and rebuild U.S. standing in the world. He remains engaged on these issues as a participant in the Aspen Institute Homeland Security Group. He wrote Homeland Security and the Post-9/11 Era, published by the American Constitution Society for Law and Policy, in January 2013. During the Clinton administration, P.J. was Special Assistant to the President of the United States for National Security Affairs on the staff of the National Security Council. He also served as Principal Deputy Assistant Secretary of Defense for Public Affairs. He spent 26 years in the Air Force, retiring at the rank of colonel in September 1999. He is a veteran of Operations Desert Shield and Desert Storm. During the Kosovo conflict, he worked under Javier Solana, then Secretary General of NATO, helping to develop a strategic communication capability in support for the NATO campaign. P.J. is a native of Massachusetts and graduate of the College of the Holy Cross. His spouse, Paula Kougeas, is also a retired Air Force colonel and now a teacher. They have two adult children and live in Alexandria, Virginia.